The front door gives access to an outer entrance hall, with access to the inner hall with trophy display cabinet by swipe card. On the ground floor is the Members’ Room, called the James H Van Alen room, after the Hawk whose widow paid off the mortgage on the Clubhouse. It is traditionally furnished with leather Chesterfields. A small office opens off this room, while at the other end two built in bookcases house various sporting books both current and historical, together with the Club’s election records. The room contains a large flat screen television. This room is a popular venue for private receptions. Most committee meetings take place in this room. 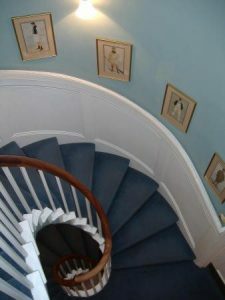 From the inner hall a spiral staircase, hung with original spy cartoons donated by David Jennens (Clare College 1947-51, Rowing), leads down to the Bar, and up to the first and second floors. The basement Bar offers a selection of excellent light meals. By prior arrangement it can remain open during the afternoon. A large flat-screen television in this room provides satellite coverage of all major sporting events. The bar itself is adorned with a number of silver mugs, purchased by individual members. The first floor Dining Room, with its splendid mahogany furniture, is available for private luncheons and dinner parties. It is used regularly for sports club dinners, and for lunchtime club tables. It has a seating capacity of 24, and may also be split in two for smaller but separate functions. Catering is mostly in house, but requires five days notice to allow for hire of serving staff, etc. Cuisine is of the highest standard, with prices held below any comparable restaurant in the city. 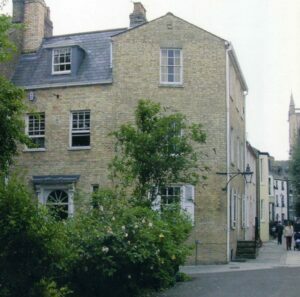 On the top floor there is a small committee room, the Alan Burrough Room, named after a major benefactor. This comfortably seats eight, and may be used for meetings. It is decorated with the entire photographic history of Hawks’ Presidents, so far as it exists. Members may book exclusive use of any of the rooms, subject to not conflicting with reasonable use by the Resident Hawks. 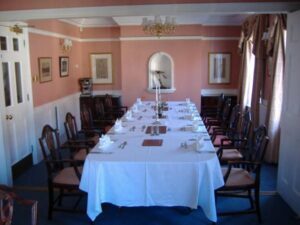 More particularly, with appropriate notice, it is possible to book the whole building for a function, especially at times when the premises would not be otherwise used, or only lightly used. In this context the Clubhouse has been very successfully used for a wedding reception, among other events. There is no charge for such hire if the function makes use of the Club’s provided catering/bar. In other cases a nominal charge is levied. All enquiries to administrator@hawksclub.co.uk .